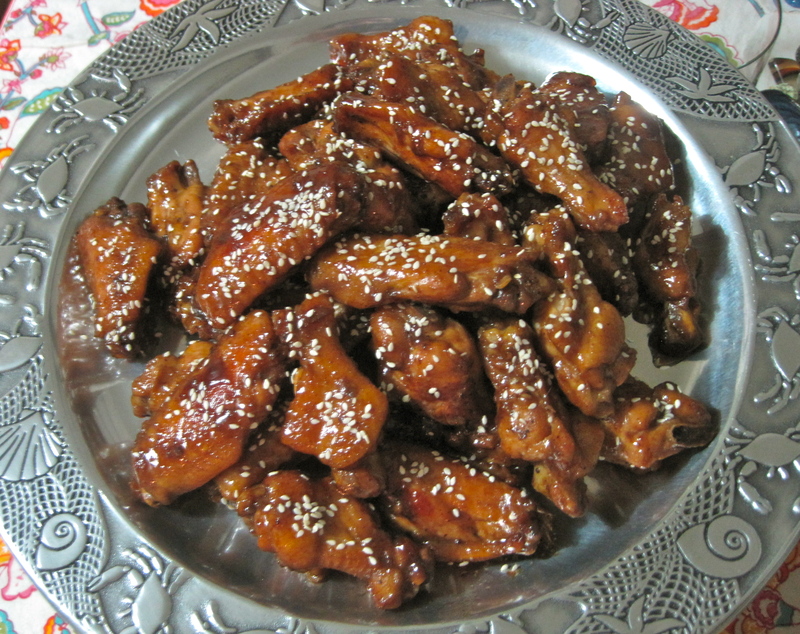 My grandma (also known to me as Mormor, the Swedish word for maternal grandmother) is responsible for bestowing upon my family our time-honored recipe for teriyaki-style chicken wings. Sure, her pickled herring, headcheese and potato sausage are revered as well (some more than others) but it’s her chicken wings that I remember most fondly from childhood. The pickled herring I only ate once on a dare. It was as awful as it sounds. 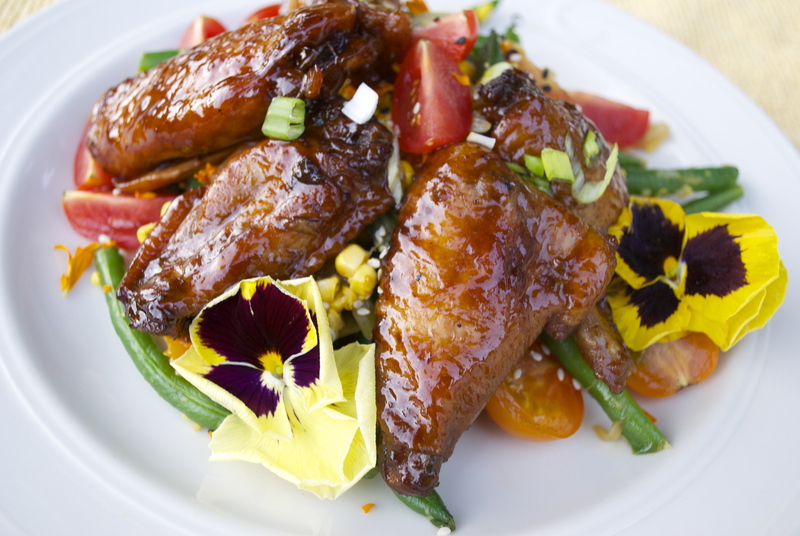 Anyways I’m not sure how the chicken wing recipe first came to be a family favorite. The vague explanation is that it was passed to her from my mother’s best friend’s mom more than fifty years ago. Where she found it, I have no idea and why she gave it to my grandma is another mystery — though a fortuitous one for sure. Normally I would never subject you to a plate of eaten food. But here’s a picture I recently sent my cousin (now in Texas) after I polished off a bunch of wings — I admit I wanted to torture him a bit. It’s one of the dishes that my grandma makes every time I go to visit her and my grandfather (along with her Swedish hotcakes which she makes every Saturday morning without fail). As a kid, when we would visit them on vacations, she used to make the wings for my brother, my older cousin and me. My brother has always enjoyed them, but my cousin and I were obsessed. We would race to eat as many as we could — counting up the bones when we were done to see who was victorious. I think most of the time we actually tied — which looking back was quite a feat. It should be noted that my cousin is now taller than me by more than a foot and is a boy to boot and I can still eat as many wings as he can. My mom also made them for our family. They were what I requested for every birthday or “special occasion” dinner. They were what I craved on my winter breaks during college. They were the first recipe my mom wrote down for me and the only reason I own an electric frying pan. It’s impossible to make them as good without one. Three generations later and these wings are still one of the dishes I make, along with my mom’s chicken casserole, when I’m feeling a bit nostalgic. Which is fairly often. Over the years, I have been spreading the chicken wing love. My best friend Nikki Sea had me email her the recipe a while back and I have now gotten my husband hooked on them as well. In fact I usually make about three times what the recipe calls for because I tend to hoard the leftovers so I can enjoy them in secret or sneak them to work for my lunch. 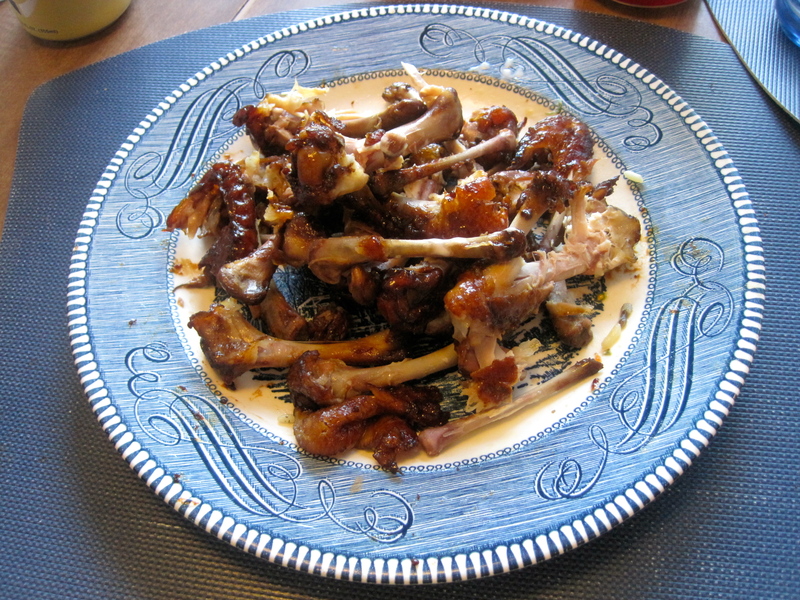 Put chicken wings in a frying pan. 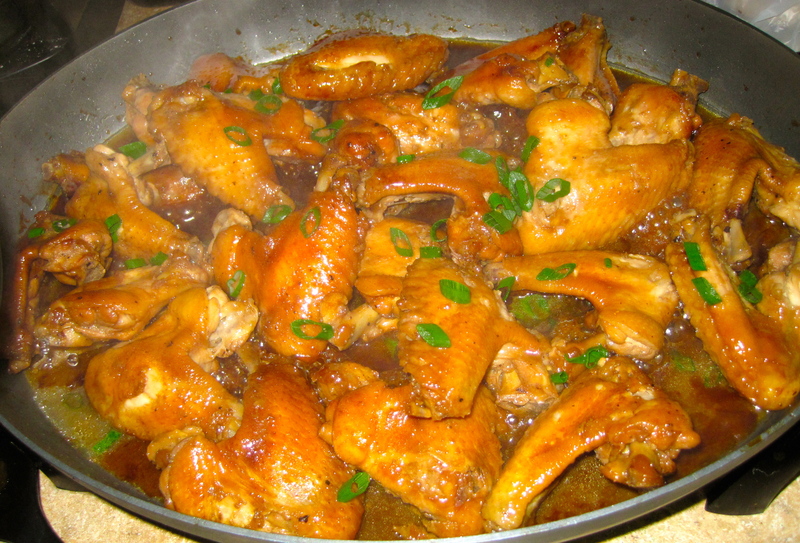 Mix all the sauce ingredients together and pour over the wings in the pan. Simmer covered for 30-40 minutes. Then removed the cover and simmer for 15 more minutes or until all the sauce has thickened and sticks to the wings, taking care not to burn them. If at any point thing are getting too dry, dump in a little more water. They are best when cooked until dark and very sticky. The meat will fall off the bone. If you’re really feeling frisky, sprinkle with some sesame seeds too. Sticky, lightly saucy and delicious! 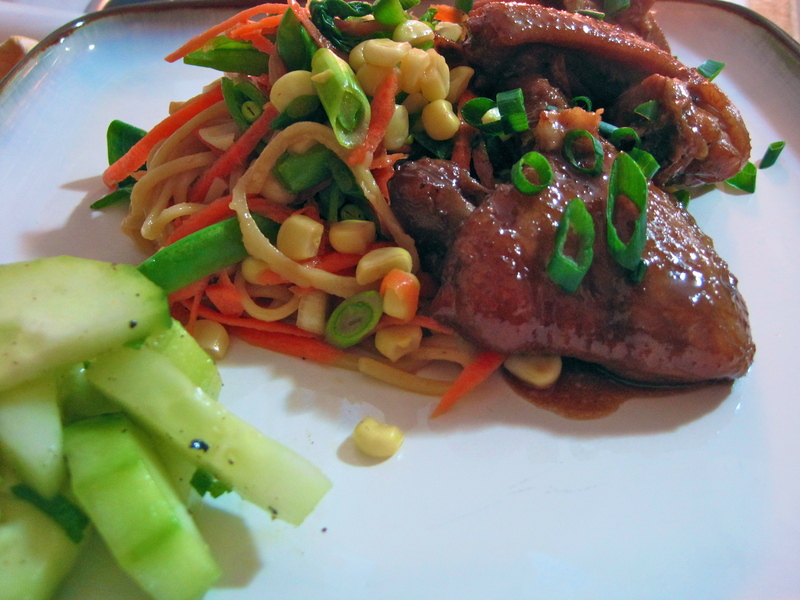 Served with a sesame noodle salad and pickled cucumbers — easy dinner. 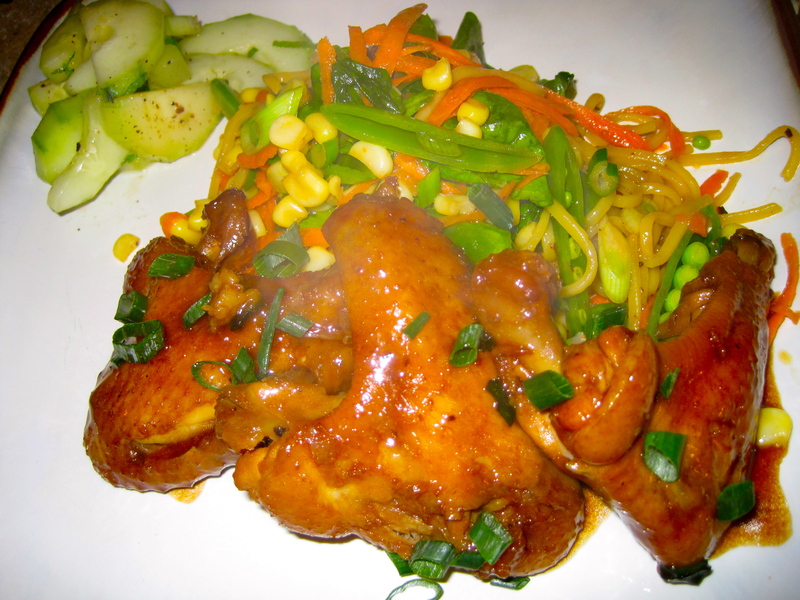 This entry was posted in Appetizers/Party Food, Drinking Food, Edibles, Entrees, Ethnically Inspired, Poultry and tagged bestthingever!, chicken, easy, food, greenonions, mormor, recipes, soysauce, wings by Jessamine in PDX. Bookmark the permalink. I just showed your blog to Grandma. She enjoyed it! Makes me hungry for some of those wings! The recipe came to us from my friend’s (Colleen) mother. It was a family favorite at her house too. Colleen’s daughter and her niece and nephew also still enjoy them.